The NIH recently awarded more than $110M in research funding for the second phase of the Knockout Mouse Project (KOMP), a phenotyping project involving an international consortium of researchers (the IKMC) who will generate about 5,000 strains of knockout mice that will undergo a large battery of clinical phenotype tests to reveal how traits are affected by deleting a given gene in an individual mouse. Knockout mice are genetically customized mice that have individual genes turned off or have a gene ramped up, to make them either more prone or more resistant to specific diseases. In partnership with several international programs, the initial five-year phase of KOMP will create knockout mouse embryonic stem cell lines for each of the protein-coding genes in the mouse genome. North American partners in the consortium include: The University of California, Davis, the Toronto Centre for Phenogenomics, the Children’s Hospital Oakland Research Institute in Oakland, Calif., and Charles River Laboratories International Inc., based in Wilmington, Mass. UC Davis is a key player in the KOMP because "NIH is committed to making knockout mouse models more widely accessible to the biomedical research community," according to James Battey, co-chairman of the Trans-NIH Mouse Initiative. UC Davis houses the KOMP Repository, where the phenotype information and stem cell lines will be catalogued and made available to researchers around the world. 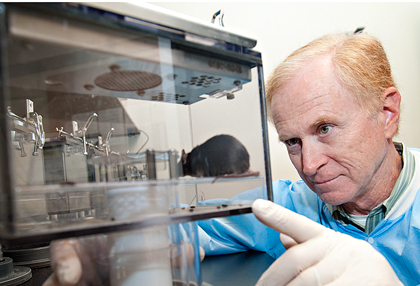 The KOMP at UC Davis also provides live mice to researchers for other projects. The goal of the first phase of the project (KOMP1) was to create a mutation in embryonic stem cells for each of the approximately 21,000 protein-coding genes in the mouse genome, allowing researchers to determine the role of each gene in normal physiology and development. In Phase Two (KOMP2), 2,500 of the mouse embryonic stem cells created in the first phase will be used to establish and breed mouse colonies, which will then be phenotyped. The second, newly-funded KOMP2, is part of a global initiative to create the repository of knockout mouse lines and phenotype data at UC Davis, which researchers can then use to develop better models of human diseases such as cancer, heart disease, neurological disorders, diabetes and obesity. UC Davis also just received a $3.8M grant to fund a new mouse-based research center devoted to studies of the physiology and genetics of obesity, diabetes and cardiovascular health, the Mouse Metabolic Phenotyping Center. Both this mouse phenotyping center and the KOMP repository are headed by Dr. Kent Lloyd, a veterinary professor and director of the UC Davis Mouse Biology Program. If you are a life science researcher in the Davis/Sacramento Metropolitan Area and are interested in learning about new laboratory products and talking with top service supply and equipment vendors about your lab needs, register to attend both of Biotechnology Calendar, Inc.'s January 2012 premium Davis tradeshow events (below). Laboratory service and equipment suppliers are invited to showcase their products and network with top university and industry researchers in this professional, popular trade show environment.